How can I connect PLC to VFD? There are a couple of thoughts on this. You could connect a PLC to a VFD using a communication protocol like Ethernet IP or Modbus to name a few or using a collection of analog and digital signals. I prefer a combination of the two ideas. For command and control signals I use analog or digital signals. For all other data I use a communication protocol. The reason is that any decent technician can troubleshoot an analog or digital signal but troubleshooting a communication protocol takes a very experienced person. The availability of a person with that skill set may be very limited so for ease of maintaining a system I use this hybrid way of controlling a VFD. It would be advisable to gain some background information on the system you are trying to put together. 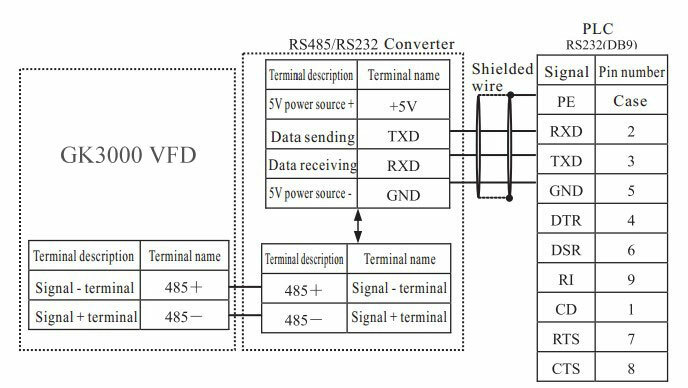 There are different means of getting the system to operate, either hardwired I/O signals to/from the VFD/PLC or by fieldbus protocols like Profibus, DeviceNet, Modbus, etc. Furthermore it also depends on your capabilities as in whether you will be engineering the system on your own or will you be utilizing external sources. The hardwired method, ie. Remote I/O, is the simplest method as opposed to the fieldbus options which requires higher level expertise in structuring your control system. Either way you will be able to control the VFD, but once again, without information on your application or system layout, guidance is limited. For possible solutions, it's better to share the type of PLC and VFD you have for the information about compatibility, ease of configuration, cost etc. Most requires parameterization of the VFD to accept defined I/O methods without much programming at PLC end other than to meet your needs.